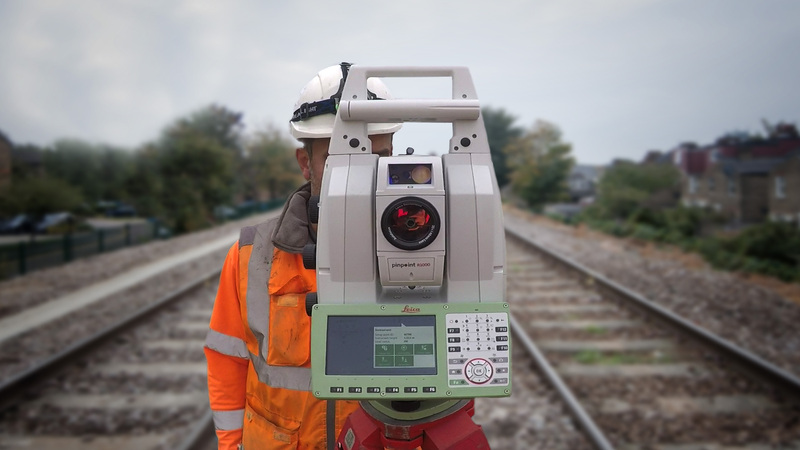 Railway Surveying is not just about tracks as we proved on the Thameslink Project. The Thameslink Programme was a huge project of track and infrastructure improvements. Asked to provide a survey for the design through the core area in London, we put together a twenty-first century dataset to satisfy this and more. 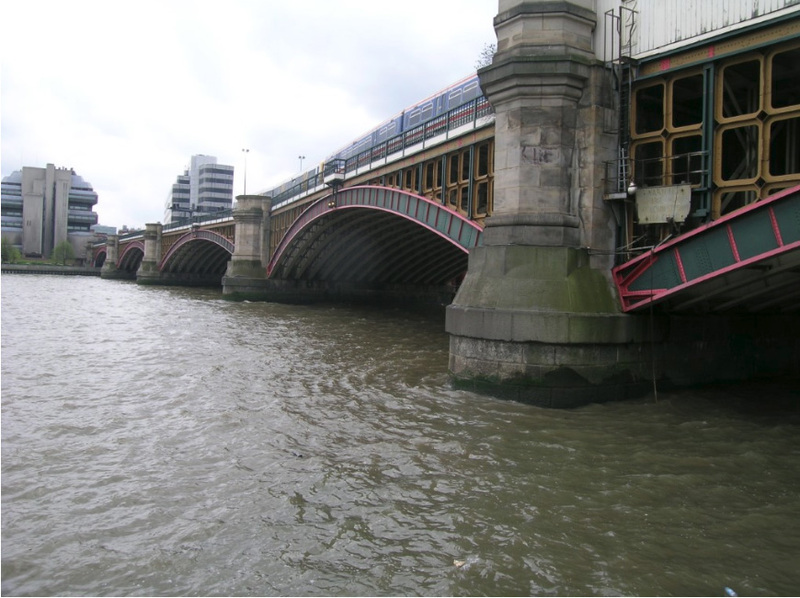 Blackfriars Bridge over the River Thames is one of a number of major re-modelling projects that was undertaken in the programme and required a completely new steelwork design to carry the re-aligned permanent way over the original steel arched river spans below. The project included a new ticket hall on the south embankment and a combined ticket hall and ventilation shaft with escalators and lifts to the mezzanine level. The existing platforms 1-3 were removed leaving the through trains to be served by extending and remodelling of platforms 4-5 to accommodate the new 12-carriage trains and a realignment of the tracks. Bay platforms were built to the west side avoiding the need for through trains crossing the paths of terminating ones. All the supporting steelwork from the arched spans upwards were replaced to support the realigned trackwork. 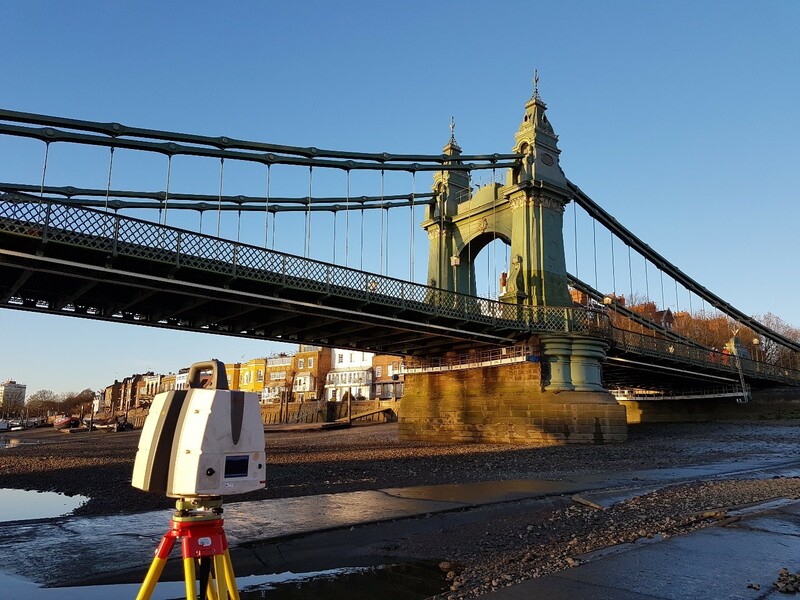 The first requirement was to survey accurately every part of the bridge and abutment structures – the question posed to ABA was how to accomplish this with an operational railway overhead and the River Thames below ebbing and flowing with a 5-6m tidal range. The existing bridge comprised of five arched spans supported on four stone piers with stone abutments on the north and south banks. The bridge had the benefit of the Blackfriars Road Bridge running parallel and at a distance of some 50m to the west. The southern three arches were of the same width while the northern two arches widen to accommodate the five platforms at Blackfriars Station. The worksite, therefore, had an operational railway above and an operational river below with all spans being classed as navigable channels so our proposed plan of survey work had to satisfy both Network Rail and The Port of London Authority. 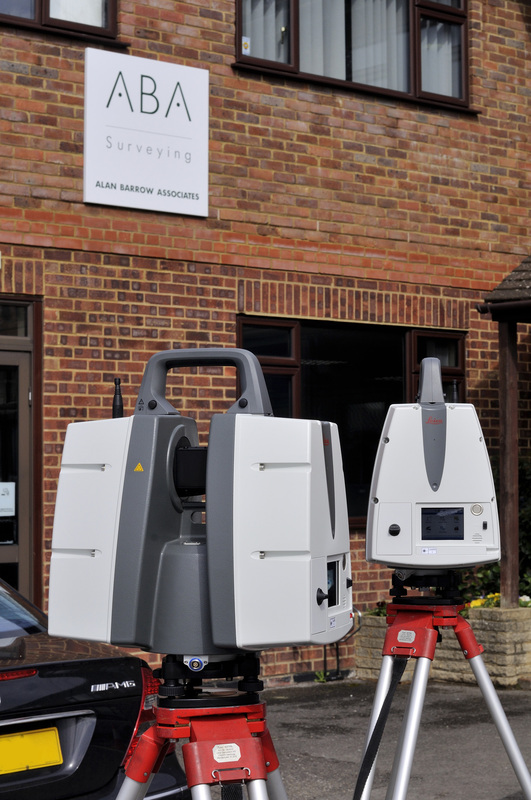 The choice of 3d laser scanning for the survey data capture was never under any question, the only issue was which scanners to use and where and how to position them. At the time the Leica ScanStation had the range but not the speed. Our HDS 4500’s had the speed and resolution but not the range. Therefore the solution we decided on was to use both and thereby harness the benefits of each. 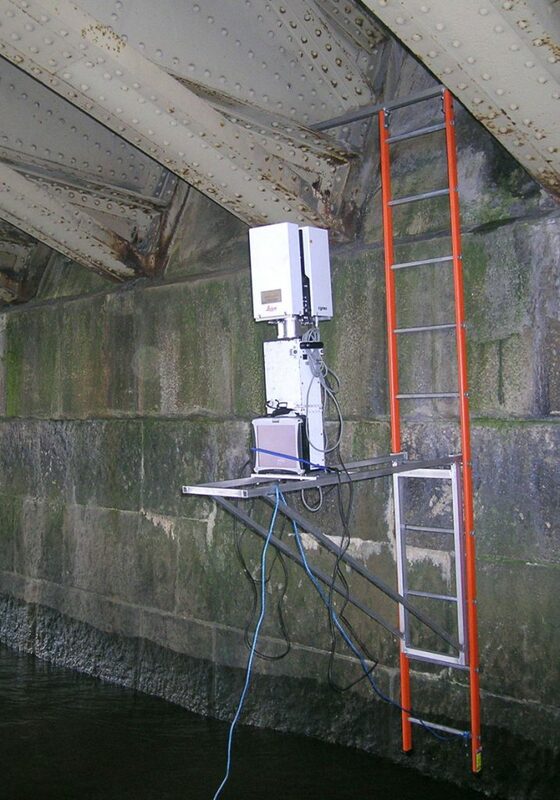 The ScanStation was used for scans from the neighbouring road bridge and embankments. These locations offered relatively stable platforms for the hour or so needed to scan at high resolution at ranges generally between 50-125m. From the road bridge, the scanner was positioned to see through the lattice of steelwork above the arched span beams. The HDS 4500’s were used for all other work. Under the bridge itself, the scan locations were chosen to see up between the arched span beams collecting detail of the underside of the bridge deck. Additional scan locations were used to record detail, services mainly, that would ordinarily have been hidden. So where did we scan from? We did briefly consider scaffolding down from the bridge parapet but the railway possession time needed to erect and then dismantle coupled with the fact that, while in place, the river navigation could be severely restricted at high tide meant that this possibility was really a non-starter from the outset. The solution adopted was to fabricate a steel ladder with a T-bar at the top that would hang from and between the arched beams and rest against the stone piers. An initial scan from the embankments enabled us to ascertain the precise length of T-bar that would be needed. We then constructed a special frame table to hook over the ladder rungs at just above water level. The speed of the operation was going to be a critical factor with the water level changing by up to a metre in one hour. Too long on the position on a falling tide and the scanner might be unreachable from the boat. Too long on a rising tide and the boat would be unable to get close enough underneath the bracket to recover the scanner before the tide engulfed it. On the table was a mounting for the battery column on top of which was the mounting for the HDS 4500 scanner. To complete the equipment a Panasonic Toughbook was connected to the scanner and secured to the frame. The whole mounting was designed to keep the scanner more than 0.8m from the nearest object to avoid the safety cut-off operating. The final addition to the mounting was a length of rope to enable us to recover the scanner should we drop it into the Thames. All part of our method statement approved by the PLA to ensure that it would not present a hazard to shipping! The table, battery column, scanner and laptop weighed just on 50kg which is fine for three persons on terra firma. For three men in a boat and the two crew members, there were skills to be acquired in what can best be described as on-the-job training. On the first day, the River Thames had waves of around 500mm that looked calm until we left the jetty. The workboat aft of the cabin had an open work area with a gunwale of some 800mm high. 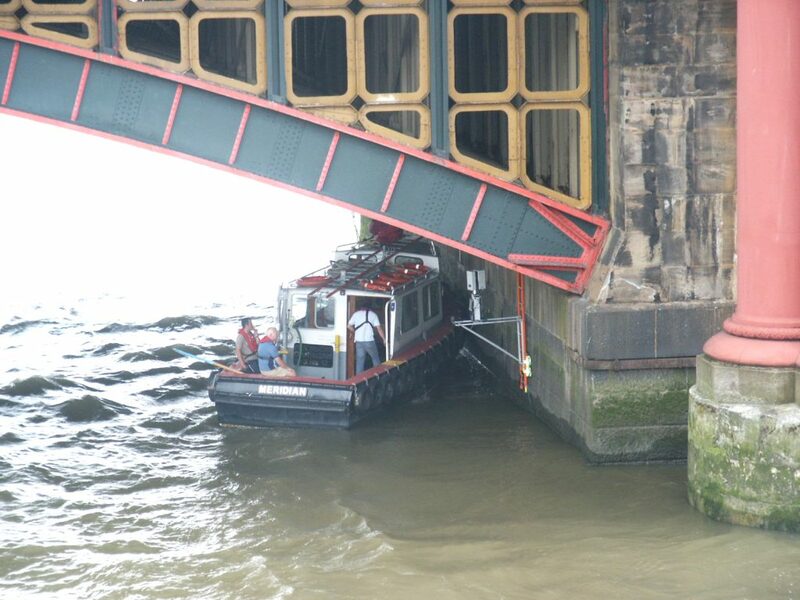 The first exercise was to get a six-metre steel ladder up between the bridge beams and turn it to lock it in place. Simple enough until you realise that the ladder must be held over the side of the workboat at arm’s length, the workboat is going up and down and needs to be kept in a stationary position away from the ladder. The second part of the procedure involved hooking the bracket with battery, scanner and laptop attached to the appropriate rung of the ladder. This was the most critical part of the mounting and involved keeping the boat away from the ladder/bracket yet close enough to enable us to engage the rungs without falling or dropping the scanner into the Thames. Now came the easy part – pull the boat away and control the scanner using a second Panasonic Toughbook and the WI-FI link. The chance for a well-earned rest while the scanner does its job. Six minutes and forty seconds later and it was time to move the scanner to the next location. The first scan took over one hour much to the amusement of a select audience on the bank during which time a lot of nautical terms were learnt while the team moulded itself into a well-oiled machine. Subsequent scans took an average of thirty minutes to complete including moving to the scan location. In total, some twenty-four scans were made of the underside of the bridge over a period of three days. 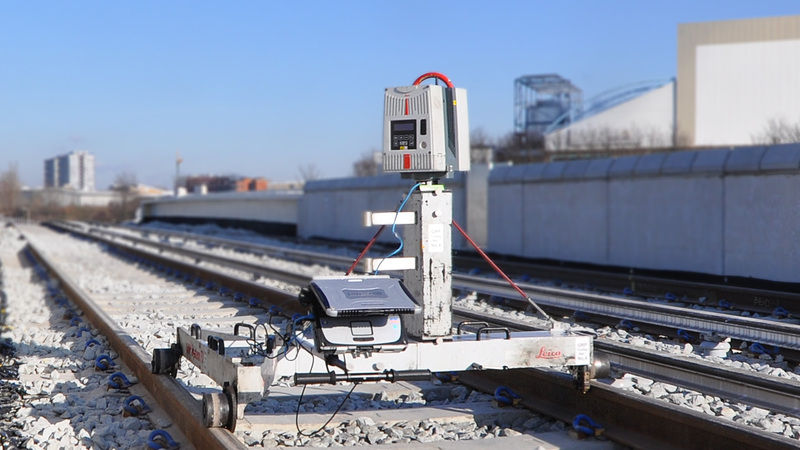 During previous possessions, the tracks and station detail had already been surveyed together with kinematic and static scanning on the bridge itself. 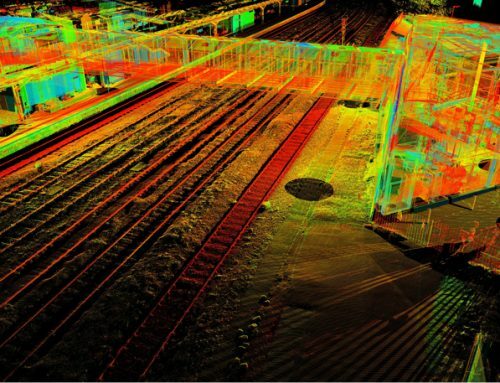 The static scanning had already been registered to the grid and included the bridge balustrades and light columns etc. For this earlier work, a control network had been established over the bridge and this was extended to the north and south embankments and to points on Blackfriars road bridge. The points on the road bridge were positioned over the bridge piers to minimise vibration effects from the traffic. 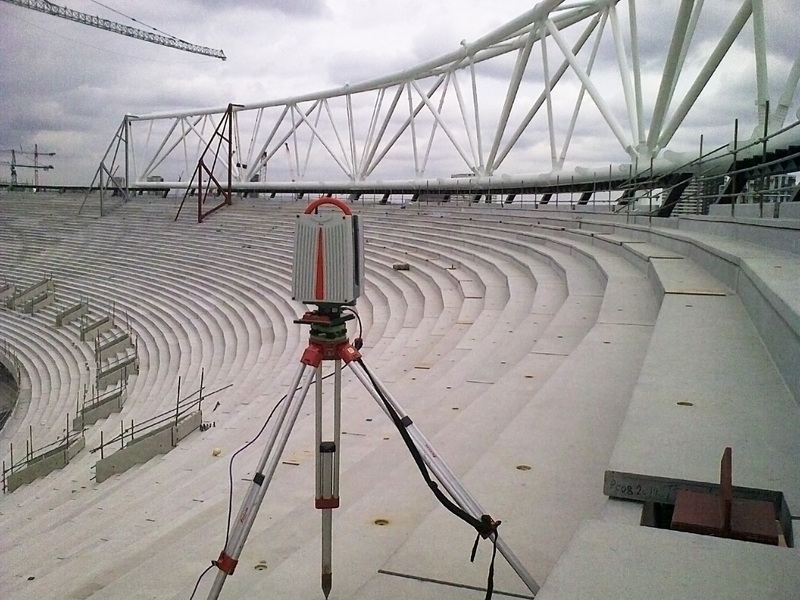 Points of detail were coordinated from this control using Leica 1201 total stations in reflectorless mode. Leica ScanStation scans were made from the road bridge and the embankments. These were registered together first (cloud to cloud) and then to the control points and to detail common with the bridge deck scanning. 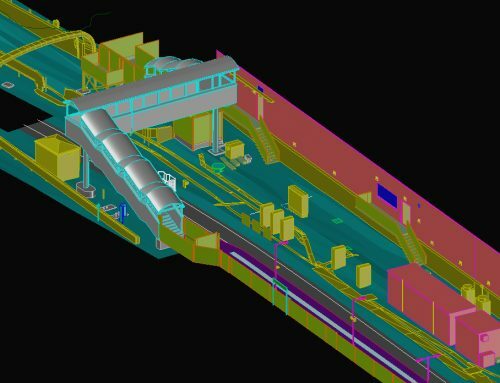 For the bridge substructure, the six scans comprising each span were first registered together using cloud to cloud registration. Each of the spans was then registered to the ScanStation scans by selected points and then by cloud to cloud. The cloud to cloud registration using Cyclone software worked faultlessly. However, due to the size of the datasets (an average HDS4500 scan has more than 30m points), most of the registration was left to run overnight even using workstations with twin dual-core processors, which at the time were classed as powerful computers! It was gratifying to see the way that the data from both types of scanners merged seamlessly together and produced a natural synergy. With the scans finally registered together and then to the project grid we were able to extract a 3d model complete in every detail from a dataset of more than one billion points, all to +/-5mm rmse accuracy. The completed survey included the buildings at either end. The underground station and ticket halls, the subways under the road, the Fleet sewer and the No1 sewer, the Corporation of London service tunnel and the Waterloo and City line, some of which you can see below. The final dataset for this one area exceeded two hundred scans. 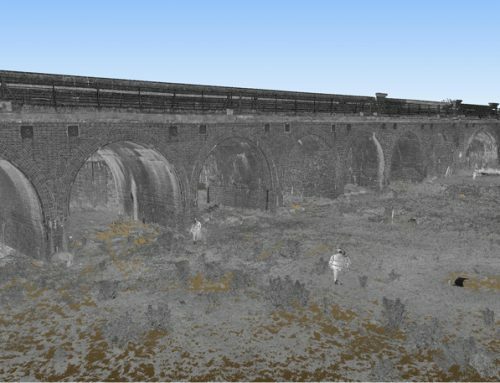 The same dataset was extended from Lewisham in the East to West Hampstead in the West and includes all structures and trackside detail in between. 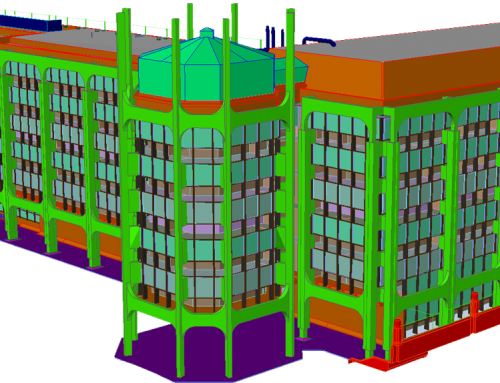 From this dataset, we produced CAD drawings and dimensional data to satisfy every discipline on the project. In the twenty-first century – at last – everyone could sing from the same hymn sheet.